Increase Productivity of Office and Mobile Employees! In honor of the 5th anniversary of Yaware you have even more opportunities for measuring and increasing your employees’ productivity. After you pay for Yaware.TimeTracker,absolutely for free you receive Yaware.Mobile — service of monitoring and control of mobile employees. And it means that now for the price of only one product you will have the opportunity to track the work of employees at the computer, and also those team members, whose activities proceed behind your office walls: drivers, couriers, sales representatives, etc. For example, you bought 10 licenses Yaware.TimeTracker for 2 months. It means that now you can control 10 mobile employees free of charge within 2 months. 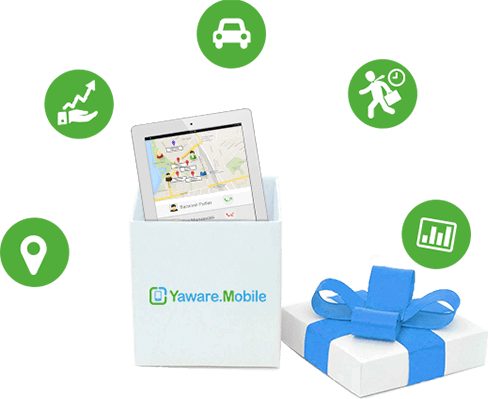 Till October 23, 2015 purchase the subscription for Yaware.TimeTracker and receive Yaware.Mobile for free for the same period. The Yaware.Mobile account will be created automatically after payment. Login details will be sent to the email which you use for Yaware.TimeTracker. The location of your employees, history of their movement and comparison with the set route. How corporate phone is used: the list of personal and work calls of employees with a binding to location. Productivity of apps: for work or for entertainment. Their ratio in terms: productive / unproductive. Increase your employees productivity and save using Yaware!